Valentine’s Day Extravaganza! Mexican Food at its Finest! This year Al and I decided we would stay in and spend Valentines Day doing what we enjoy most. Yup! That’s right! COOKING!!!! So, I thought I would make it special and cook up Al’s favorite–Mexican food!!! 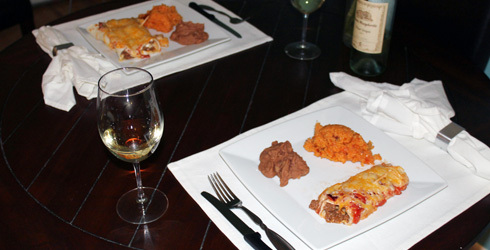 On the menu: Mexican rice, refried beans, and my homemade enchiladas! And for dessert, none other than Mrs. Rodriguez’s flan de coco. If that doesn’t sound amazing, I don’t know what does! Seeing that I start most of my cooking sessions with a glass of wine, I clearly had to keep tradition alive! So, I raised my glass, made a toast, and into the kitchen I went. I mean I was cooking my own recipe for god sakes! This called for a celebration! I started by cooking up some of that good ol’ Mexican rice. As we all know I live and die for flavor and nothing makes me happier than when a dish is spiced up. So, I got to it! I sautéed green peppers, red peppers, onions, garlic, and cilantro in some olive oil. In another pot, I combined white rice, chicken stock, and a packet of Sazón con Cilantro y Achote (Spanish seasoning). After about 15 minutes, when my rice had soaked up most of the chicken stock I threw in my veggies. Olive oil and all! Wowzers! The sizzling noise in the background was like music to my ears! And the smell, oh the smell was to die for! The cherry on the sundae; adding tomatoes. Can’t have Mexican rice without them! Next on the agenda, my homemade ground beef. As my mom would say “season, season, season!” And that’s exactly what I did! Adobo, oregano, cilantro, just to name a few! 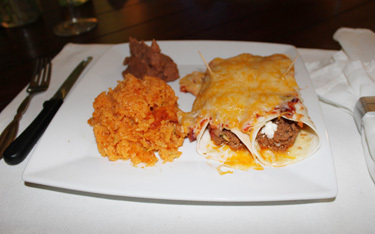 Once my ground beef was all ready, I added some sour cream and started rolling up my enchiladas. To top it off, I drizzled my homemade tomato salsa and added lots and lots of cheese! I was loving it! I mean the rice smelled amazing, the ground beef was sizzling, and the refried beans were beginning to simmer! It was perfection! Okay, now brace yourselves! I really don’t know what to say or even how to say it, but here it goes: Mrs. Rodriguez’s flan is U-N-B-E-L-I-E-V-A-B-L-E!!!! Best flan I’ve ever had by far! And I mean far!!! Mmm-Mmm-Mmm! To sum it all up: Preparation time 1 hour, cooking time 1 hour and half…Drum roll please… eating time 20 minutes! Al and I just gobbled it right up! Sooooooo worth it!